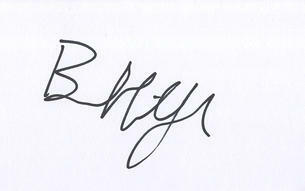 This is an In Person signed white card 5.5" x 3.5" by the Australia Test Cricketer. Benjamin William Hilfenhaus (born 15 March 1983, in Ulverstone, Tasmania) is an Australian cricketer who plays for Tasmania in Australian domestic cricket. He is right-arm fast-medium bowler known for his ability to swing the ball. Hilfenhaus plays club cricket for Tasmania University Cricket Club. He made his first-class debut in the 2005/06 season and his haul of 39 wickets was a record for someone playing their first season for Tasmania. Before he was given a full-time contract for 2006/07, he worked as a bricklayer as well as playing cricket. He has best bowling figures of 7/58 in first-class cricket, achieved in his first season for Tasmania. In January 2007 Hilfenhaus made his One Day International (ODI) and Twenty20 International (T20I) debuts for Australia. The following month he was named the Bradman Young Cricketer of the Year. The 2006/07 season saw Hilfenhaus named Tasmania's Player of the Year as the club won the Pura Cup for the first time. Due to injury setbacks he had to wait until 2009 before making his Test debut.